Are there any cat breeds that don’t shed? While hairless cats are the only completely non-shedding kitties, these 10 breeds shed very little. Sure, you love cats, but oh the shedding and the grooming are two things you could do without, right? Maybe you have allergies or maybe you just don’t have the time for the grooming routine. This is completely understandable and that’s why this list provides you with cat breeds that don’t shed or shed very minimal. 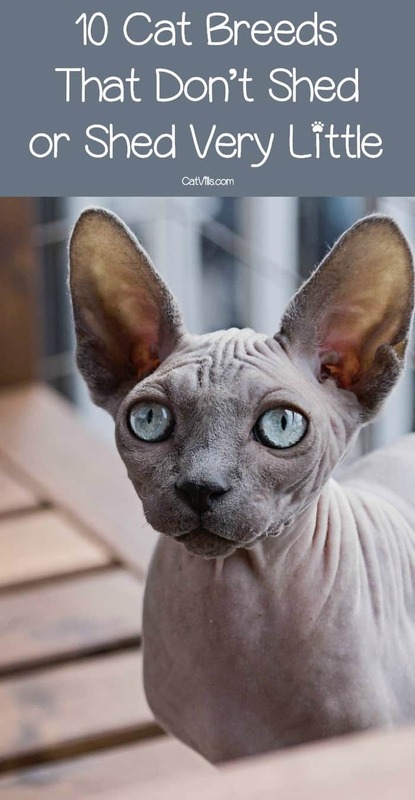 Remember, the only completely non-shedding cat is a hairless cat! Still, these beauties aren’t nearly as big of shedders as some of their long-haired counterparts. Burmese cats are similar to Siamese cats, except they are more muscular than the Siamese. While they feature a thick coat, it is short and just needs an occasional brushing. They love being around people and don’t really like being alone. The Cornish Rex is a miniature cat breed. Their coat is very short, sparse and lies close to its body. These cats are active, affectionate and people-oriented. They shed very minimally. The Korat cat hails from Thailand. Their silvery-blue colored coat is short, shiny and single-layered. These cats are strong-willed but also gentle and love to cuddle with their owners. Many people compare the Ocicat to being the domesticated version of the wild, spotted cat like the leopard or the ocelot. They are the result of inter-breeding Abyssinian, American Shorthair and Siamese cats. Their coat is satiny, soft, short and tight. These cats are confident, dedicated and devoted. Oriental cats feature a short coat and don’t hardly shed at all. They are the ideal cat to greet you at the front door, so they can tell you how their day was. These cats are curious, intelligent and loyal. The Russian Blue has one of the most unique appearances of all the cat breeds, with its coat that is blueish-gray in color and eyes that are luminous green. 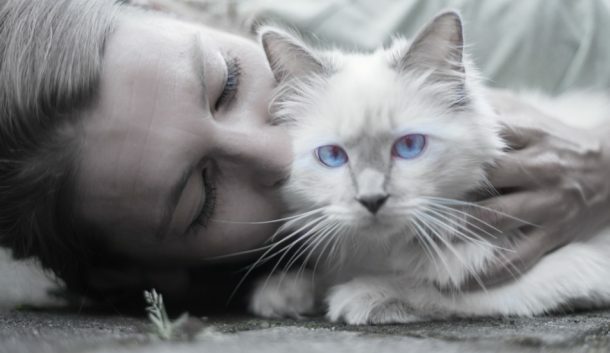 They shed just once or twice a year and don’t produce as many allergens as other cat breeds. Like the Korat, the Siamese cat is another breed that hails from Thailand. Their coats do a great job of trapping fur, so they only require occasional brushing. These cats are inquisitive, intelligent and loving. The word Singapura comes from the Malaysian word- Singapore. These cats are small in size and feature short-haired coats, large eyes and large ears. They are curious, interactive and playful. Many people think that the Sphynx cat has no hair at all. While it is true that they don’t have a coat, they aren’t hairless cats. They do have an extremely fine down on their body. These cats are energetic, lovable and mischievous. Much like the Siamese cat, the Tonkinese cat features a short, tight coat that works well in trapping fur. These cats are slender, but also very muscular. They are active, loving and playful. Do you have any of these cat breeds that don’t shed much? What tips can you offer to keep their shedding to an absolute minimum? Share below! Perfect cats for those who want a cat but allergies to the fur stop them from becoming cat owners. Now they can enjoy the company only a cat brings. These breeds would be perfect for a person who has always wanted a cat but could not get one due to allergies. They are too cute and they look very lovable! That Russian Blue cat is so pretty! If I ever have another cat, I’ll definitely pick one that doesn’t shed. Such cute cats! My kids have been begging for a pet that doesn’t shed. This is a good list to start with. I was never a cat person (I’m allergic) but my neighbors have two that don’t really shed. They’ve changed my mind about cats as pets. I love the caveat of “much” lol! We have a short haired Tortie, so thankfully, she doesn’t shed too bad. Keep the brush handy and use it frequently to minimize shedding for both cats and dogs. I just spent my last week amongst 7 furry friends, so I know how much they shed! I will have to keep these breeds in mind if one day I decide to get a cat. If we will get a cat, I really need to consider this thing because we have a kid and a history of asthma. I have heard about the Sphynx, others are just new to me. This is good to know information. Especially if you have an allergy and are planning to get a cat. Will share with a friend who is looking to get a cat. Wish we had thought about this before we got our two little rescues. There’s cat hair everywhere in our house!